Nothing from April 18, 2019 to April 18, 2020. Had a great time with my cousin Jaycee and Lanie & Coty from @bluedogk9 learning about training police & bomb dogs! Back on the ice for round 2!! Aidan Brooks Racing in the News! 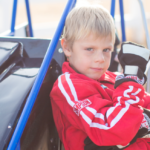 Aidan Brooks is a speed lover currently racing quarter midgets. In 2018, Aidan raced in three divisions: Senior Honda, Senior Animal and Light 160. 2018 highlights include: In his last Junior race, taking 2 cars to the A mains at the USAC Phoenix National event. He won his Honda heat and finished 4th in the Junior Animal A main! Not to mention, Aidan got to meet Mario Andretti! 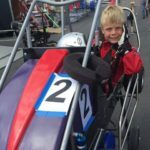 Aidan will start 2019 with his 3 current cars for the club racing season in Colorado. The team plans to add a Light World Formula to the fleet before the Grands National event in Colorado in July. Aidan’s other loves include ice hockey. He plays club and travel hockey with the Northern Colorado Junior Eagles. Aidan plays defense and goalie, helping the team in whichever position Coach thinks is best that day! Last year, Aidan discovered American Ninja Warrior on TV and another spark was ignited! He started ninja training in May of 2018 and now competes in events of the Colorado Ninja League, National Ninja league and the United Ninja Athletic Association. In his first season competing he is seeded 4th in the upcoming CNL finals, qualified for NNL Nationals (which we passed on to play a tournament with his hockey team) and UNAA Regionals which are this June! Stay tuned! Aidan is also in the process of completing his application and hopes to be selected for American Ninja Warrior Junior Season 2. Wish him luck! Aidan is a history buff, especially the WW2 air war. He reads anything he can get his hands on on this subject. He wants to be a fighter pilot in the Airforce! With an unconventional non-racing background, and a quick, analytical mind, Aidan’s thought process is very different than most racers— giving him quite a competitive edge. However, he still maintains humility and compassion towards other drivers, as well as his classmates, making him both a great competitor and sportsman. Aidan is a hard-worker, compassionate, and funny. 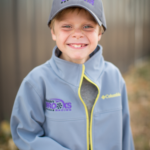 Highly-driven, Aidan and his team aim to contribute integrity, fair-racing and safe racing to the sport.